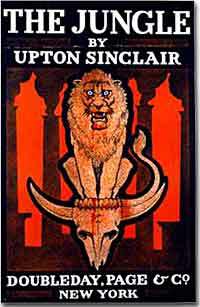 Upton Sinclair published The Jungle in 1905 to expose labor abuses in the meat packing industry. But it was food, not labor, that most concerned the public. Sinclair's horrific descriptions of the industry led to the passage of the Pure Food and Drug Act and the Meat Inspection Act, not to labor legislation. It may be a cliché, but it was all too true for journalists at the turn of the century. The print revolution enabled publications to increase their subscriptions dramatically. What appeared in print was now more powerful than ever. Writing to Congress in hopes of correcting abuses was slow and often produced zero results. Publishing a series of articles had a much more immediate impact. Collectively called muckrakers, a brave cadre of reporters exposed injustices so grave they made the blood of the average American run cold. The first to strike was Lincoln Steffens. In 1902, he published an article in McClure's magazine called "Tweed Days in St. Louis." Steffens exposed how city officials worked in league with big business to maintain power while corrupting the public treasury. More and more articles followed, and soon Steffens published the collection as a book entitled The Shame of the Cities. Soon public outcry demanded reform of city government and gave strength to the progressive ideas of a city commission or city manager system. Ida Tarbell struck next. One month after Lincoln Steffens launched his assault on urban politics, Tarbell began her McClure's series entitled "History of the Standard Oil Company." She outlined and documented the cutthroat business practices behind John Rockefeller's meteoric rise. Tarbell's motives may also have been personal: her own father had been driven out of business by Rockefeller. 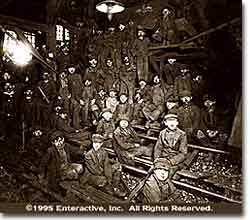 John Spargo's 1906 The Bitter Cry of the Children exposed hardships suffered by child laborers, such as these coal miners. "From the cramped position [the boys] have to assume," wrote Spargo, "most of them become more or less deformed and bent-backed like old men ... "
Once other publications saw how profitable these exposés had been, they courted muckrakers of their own. In 1905, Thomas Lawson brought the inner workings of the stock market to light in Frenzied Finance. John Spargo unearthed the horrors of child labor in The Bitter Cry of the Children in 1906. That same year, David Phillips linked 75 senators to big business interests in The Treason of the Senate. In 1907, William Hard went public with industrial accidents in the steel industry in the blistering Making Steel and Killing Men. Ray Stannard Baker revealed the oppression of Southern blacks in Following the Color Line in 1908. Perhaps no muckraker caused as great a stir as Upton Sinclair. An avowed Socialist, Sinclair hoped to illustrate the horrible effects of capitalism on workers in the Chicago meatpacking industry. His bone-chilling account, The Jungle, detailed workers sacrificing their fingers and nails by working with acid, losing limbs, catching diseases, and toiling long hours in cold, cramped conditions. He hoped the public outcry would be so fierce that reforms would soon follow. 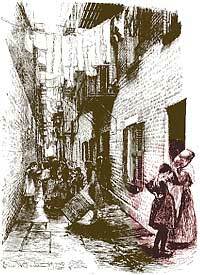 This sketch of "Gotham Court" from Jacob Riis's How the Other Half Lives shows the bitter side of tenement life. The clamor that rang throughout America was not, however, a response to the workers' plight. Sinclair also uncovered the contents of the products being sold to the general public. Spoiled meat was covered with chemicals to hide the smell. Skin, hair, stomach, ears, and nose were ground up and packaged as head cheese. Rats climbed over warehouse meat, leaving piles of excrement behind. Sinclair said that he aimed for America's heart and instead hit its stomach. Even President Roosevelt, who coined the derisive term "muckraker," was propelled to act. Within months, Congress passed the Pure Food and Drug Act and the Meat Inspection Act to curb these sickening abuses. More than 70 years before Rosa Parks refused to give up her seat on a bus, Ida Wells refused to give up her seat on a train. Wells was forcibly removed in an incident that ignited her "passion for justice" and led to her career in journalism. She also became a founding member of the National Association for the Advancement of Colored People. This biography from Duke University includes a picture of Wells and a link to her 1899 articles about lynchings in Georgia. Allegheny College has dedicated this website to their famous alumna Ida Tarbell, a 2000 inductee into the National Women's Hall of Fame. Take a look at the journalist's papers, correspondence, photographs, and memorabilia. Read her biography, then follow the links to the best Tarbell resources on the Web. The Museum of Questionable Medical Devices has put together this webpage on Samuel Hopkins Adams, whose series of articles entitled "The Great American Fraud" exposed the fraud of the patent medicine industry. Adams' work led to the establishment of the Food and Drug Administration. Read the overview and the text of "The Great American Fraud." Then, for some real kicks, click on the links at the end of the page to see what "medicine" people used to waste good money on. Ida Tarbell, who documented the growth of the Rockefeller's Standard Oil Company in 1904, got her start working for McClure's magazine and was one of the first women muckrakers. This article from the Christian Science Monitor describes Tarbell's career and includes links to sites about her. Part detective, part writer, investigative reporters have dedicated their pens to exposing society's hidden evils. At the Center for Investigative Reporting, learn about these modern muckrakers .